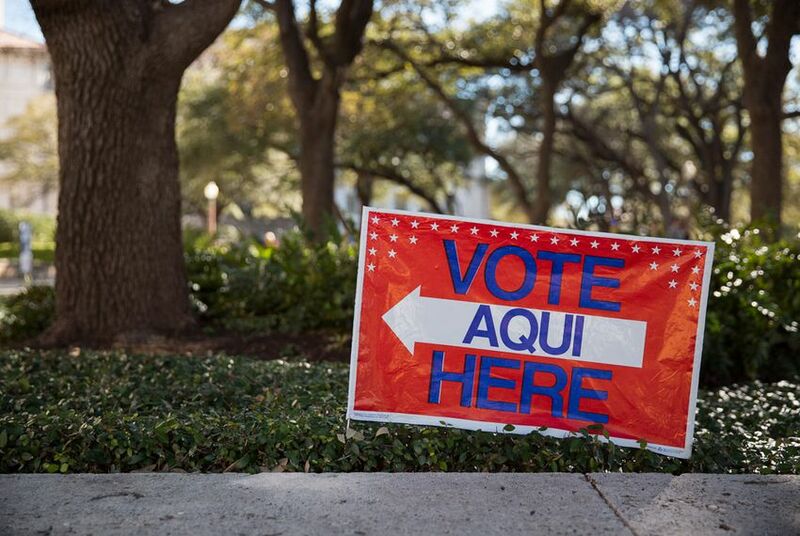 Turnout among Texas Hispanics eligible to vote rose slightly in the 2016 presidential elections compared to four years earlier, according to newly released U.S. Census data. There were high hopes that this would be the year. Amid Donald Trump's disparaging remarks about Hispanics and on-the-ground voter engagement efforts, election watchers prognosticated that 2016 could usher in a surge of Hispanic voters in Texas. But now that the excitement around the 2016 election has quieted, the surge appears to have been more of a trickle. Turnout among Texas Hispanics eligible to vote — citizens 18 and older — in 2016 slightly improved, increasing to 40.5 percent from 38.8 percent during the 2012 presidential election, according to U.S. Census data released Wednesday. The small increase is a discouraging sign for those who expected a spike in Hispanic turnout. Instead, turnout among Hispanic Texans during presidential elections continued its slow, steady increase since 2008, mostly in line with population growth and possibly more Hispanic Texans turning of age to vote. But last year's turnout is still lower than turnout in the 2004 presidential election. Only black and Asian Texans saw significant changes in turnout compared to the last presidential election. Considering those eligible to vote, black turnout dropped from 63.1 percent in 2012 to 57.2 percent last year. Meanwhile, turnout among Asians — a small sliver of both the state's overall population and the electorate — jumped up from 42.4 percent to 47.3 percent. For Asian voters, that surge translated into an increase of 124,000 more votes in 2016, a larger increase than what Hispanic voters showed, according to the Census data. Compared to 2012, Hispanics only cast about 48,000 more votes in the 2016 election. White Texans, meanwhile, increased their total number of ballots cast by about 818,000 votes. Asian voters, in particular, were credited for helping flip the reliably-Republican Fort Bend County into the Democrats' column in 2016. The Asian share of the population in that suburban enclave southwest of Houston is four times as high as their share statewide. Some had also pinned their hopes for improved participation among Hispanics on sweeping Democratic victories in places like Harris County where number crunchers indicated that an increase in Hispanics voters were, in part, behind those wins. But the Census numbers suggest that didn't translate to a significant statewide increase. The Census estimates offer the first glimpse at a breakdown of turnout by race and ethnicity in the November election at a time when Hispanic turnout was highly anticipated to swell. But election watchers probably shouldn't take much stock in what the 2016 numbers could mean for the upcoming midterm elections — Texas’ dismal voter turnout is even worse during non-presidential years.